One of the most famous omelettes is the Arnold Bennett omelette that came about because the famous writer of that name was very keen on a savoury omelette made at the Savoy Hotel. Bennett was so keen on this dish-made with smoked haddock, single cream, grated cheese, butter and 6 large eggs-that the omelette was named after him and became recognised as a speciality of the London Hotel. Where would we be without the good honest hen’s egg? Never mind what came first, the chicken or the egg, let’s explore the credentials of a perfect omelette. There are two basic types of omelettes: plain ones, which are usually served as a main meal with different fillings, and fluffy omelettes, which may be used for either sweet or savoury fillings. A special omelette pan is useful, but if there’s not one available, a small frying pan will do. Break the eggs into a bowl and add the milk (or water) salt and pepper. Beat together with an electric hand blender or whisk until the mixture is thoroughly blended but not frothy.Heat the butter in a pan but don’t allow the butter to brown-that’s too hot! Pour in the egg mixture and cook over moderate heat.Use a spatula to lift the edges of the omelette as it cooks-this will allow the egg to run underneath, so that it is in contact with the hot surface and will cook evenly. When the omelette is nearly set, but still very slightly runny on top, the part in contact with the pan will turn a golden brown.Use a spatula to fold the omelette in half and slide it onto a warmed dinner plate. Grated cheese is a favourite-add about 25g of grated cheese to the mixture before it goes into the pan. When it’s cooked, finish off under the grill if you fancy, with a little more grated cheese. Chopped ham can be sprinkled over the omelette before you fold it over or use diced cooked chipolatas instead.A combination of ham and cheese works well and provides a main meal when served with a crisp green salad and chunky chips. Peas, mushrooms, spring onions, asparagus, tomato (flesh only) and other cooked vegetables can be added either to the mixture, before it is cooked, or as a savoury filling for the finished omelette. Avoid using ingredients with high water contents in the mixture-they may make the omelette too watery and stop it from setting properly. To separate the eggs first crack them across the centre with a knife. 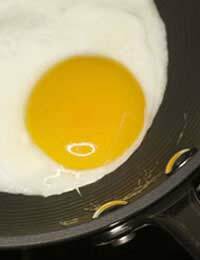 Use both halves of the egg shell (and both hands) to separate the white from the yolk by allowing the white to flop into a bowl as you pour the egg from one shell half to the other, carefully cupping the yolk as you go. If all goes well, you should be left with the yolk sitting neatly in one half of the shell and the white in the bowl. (Don’t discard any that rebel and break out-save them for scrambled egg! )Beat the yolks in one bowl with 12g caster sugar and vanilla essence. Whisk the whites in another mixing bowl-until they become white and frothy. Next, gently fold the whites into the yolks and proceed as with the plain omelette.When set, spread with a layer of warmed jam, pureed fruit or honey and chopped banana before folding over the omelette.Serve with cream, caster sugar or syrup of your choice. If you wish to make a savoury fluffy omelette, omit the sugar and vanilla, instead use salt and pepper. First tym ive made one was great. Even hubby n little one enjoyed it.